Do you really have a pet sloth? Yes. Yes, we do. Her name is Zo and we love her very much! In the United States, every single state has its own laws about exotic animal ownership, as do the counties and cities inside them. BornFreeUSA.com has a great outline of the states’ varying laws. How do you know Zo wasn’t taken from the wild? We met with several people who work with breeders, importers, and zoos—among a number of other places—until we found someone we were very comfortable with and whose breeding practices we trusted. Once that happened it was a matter of time before Zo was born. If sloths are so important to you, why don’t you take Zo to South America and set her free? 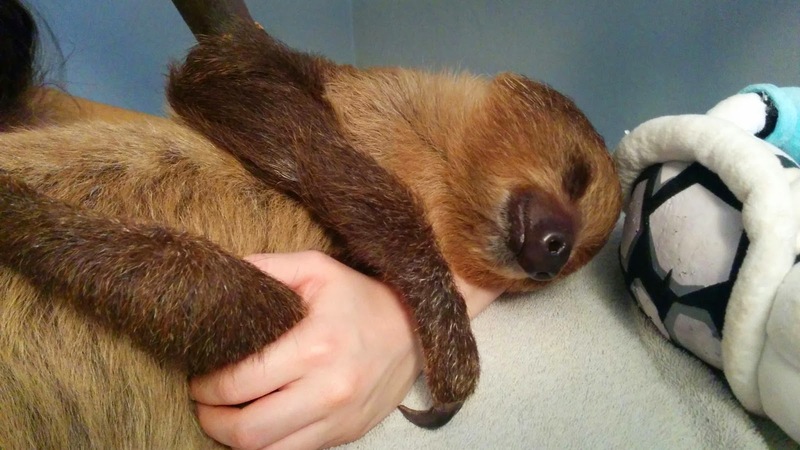 How difficult is it to adopt a sloth? Very! Anytime you are looking into an exotic animal, there are many, many hoops to jump through, and a sloth is no exception. It took well over a year of working with the state to receive the right permits, biologists to approve our habitation, and the city for even more permits (among other things). After that, we had to do our research and make absolutely sure she was a captive born baby; we would never pull an animal from the wild! Then there was the most difficult part of all: The waiting game. How much does a sloth cost? Bringing home a baby sloth doesn’t come cheap! Over the course of her 20+ year life, Zo’s care will cost us over $100,000—and that doesn’t even include any possible medical emergencies. The cost of her daily care routine is just under $14 a day in heat, electricity, food, and water for the humidifier. What do you do if Zo gets sick? We can take care of sniffles and minor booboos on our own, but Zo has to go to the doctor for anything more serious than that. We are very lucky to have an exotic animal vet nearby who has done extensive work with sloths, so we’re in good hands if something comes up that we feel is outside our ability to handle. Why do you have a donation button? Is Zo going hungry? Why are you so secretive about your identity? Are you Batman Slothman? Unfortunately, some overly enthusiastic sloth lovers are uncomfortable with how “unnatural” it is to keep Zo in captivity. (We don’t blame them; it’s easy to forget that for a captive-born baby like Zo, an enclosure is their natural environment!) Because we don’t want to put our precious Zo in any sort of danger, we’re a little shy about our identity. We hope you can be our friend anyway! I can't click the Email or FAQ buttons! What gives, Webmaster? I know, I know. Maximize your browser window and the problem goes away! It seems to be something weird on Blogger's end... If you have a solution, please contact me. I have a question that’s not listed. How do I contact you? Fill out the contact form here! We’ll get back to you as soon as possible.